Casey is creating a stable life until his old flame Elissa comes back into the picture, and they escape on a whirlwind adventure. Together they form a wave of passion and destruction but as unexpectedly as she came, she leaves. Casey attempts to heal himself with work and promiscuity to clear her haunting presence. Will they accept their fate? Using a whirlwind of amazing locations that compliment the whirlwind of a story, "On The Horizon" truly is a visual beauty to watch. It's almost as if writer, director Pascal Payant scouted for nothing but the most appealing locations, and wrote a film around them. Of course that's not the case, considering the story of the film is just as well formed as it's cinematic graces; it's just unusual for an indie film, without a few million dollars to burn to have both. To write that I was impressed would be a terrible understatement. No doubt about that. The core of this film is the ever popular love story and let me be honest reader, I'm definitely not a fan of the romance genre. In this case however, I really couldn't stop watching. Perhaps this was because the romantic nature in question was a troubled one, or maybe it was simply the great visuals. 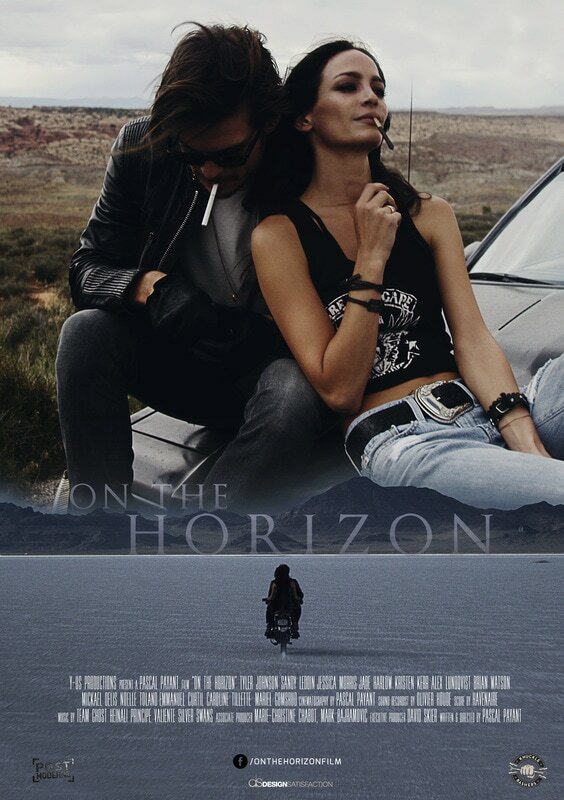 Either way, for an indie film without a massive budget behind it, "On The Horizon" easily holds it's head up with the more budgeted recent studio productions I've seen. In many cases, it surpasses them. One of those few indie films that holds it's own, almost shot for shot with your favorite romantic drama from your favorite studio. This isn't a red balloon and ice cream kind of romance. No way. Anyone looking to see the next bubbly, comedic love story should look elsewhere. This film, although bright and shiny visually, holds a story that is completely the opposite. Perhaps that's part of the beauty, the contrasting elements co-existing in the same film, bringing a darkly poetic quality to the narrative. This is a love story for the less perfect people in the world, the broken people. The simple fact is, this is a romance for the semi-romantic. A realistic look at those of us who are not perfect. In and for this reason, Pascal Payant has created a winning title, one that easily separates itself from the competition. Here's where things get interesting... when writing about the technical elements. Visually, this title really is the exact opposite of bad. Even the few shots where the lighting feels off, the image is a little blurry or the framing isn't quite right... all fit and mix perfectly with what's happening onscreen. Almost like these "B" shots were made that way on purpose, and all things considered, perhaps they were. This is all held together with a very classy production edit, that does just what the doctor ordered. Keeps things moving at an excellent pace. Other highlights of the film production include some excellent montages, especially during the first few minutes. These mini-music videos each tell a story, and are done remarkably well. Finish things off with a great dialog mix and excellent post-color work and technically, "On The Horizon" ends with a stellar grade from myself. The cast, especially our leads Tyler Johnson and Sandy Leddin, do fantastic jobs. Leddin perfectly embodies the broken girl with severe personal issues and Johnson, as her counterpart, delivers a powerful performance through-out the film. These people are real, gritty and complicated; never cheesy and scripted. The supporting cast also happen to easily hold their own and didn't feel like "supporting" actors, rather regular people revolving around such complicated characters. From a viewers perspective, I have two thumbs up when writing about the acting of the film. Great job. Finally, I want to touch on the story itself. Though the mysteries of our characters play a huge role in the feel of the film, I was a little put out by the open ended nature of the movie. By no means am I writing a happy ending is needed, the most interesting movies don't have them, yet some kind of closure to the story, anything a little more concrete would have been great. The same can be said for Leddin's character Elissa. We understand she's broken. Finding out a bit, even a little, of the reason why would have done amazing things for this particular story. Mysterious and open are good, but some reasoning, even if fragmented would have been better. Overall this is one hell of a film. Visually exceptional and maintaining the ability to mesmerize it's viewers, even if they don't like the genre. If I was a natural fan of this type of story, I have no doubt my rating would have been higher. Considering I'm not, and still found this an exceptional indie film speaks volumes. Here's one to see. It's really that simple.